This hearty soup has a lovely golden hue and rich tasting mouthfeel, somewhat like a bisque and reheats and freezes well. Place olive oil in a 5 quart saucepan over medium high heat, Add garlic, onion and carrots and sauté 3 minutes. Add potato and butternut squash and cook mixture for 8 minutes or until vegetables are crisp tender. Add broth and bring to a boil. Cover, reduce heat to low and simmer for about 40 minutes. 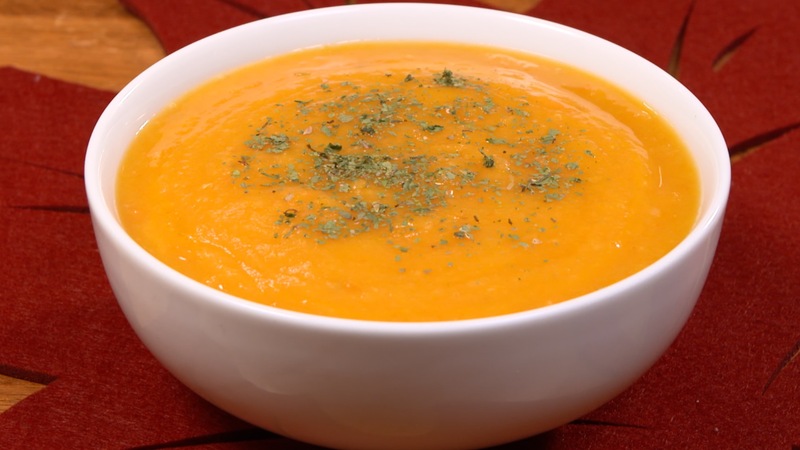 Using an immersion blender, blend soup until smooth. Add vinegar and nutritional yeast, salt and pepper. Keep warm until ready to serve. Garnish with cilantro, enjoy! Calories 157, Protein 4g, Carbohydrates 33g, Fiber 5g, Fat 2g, Cholesterol 0, Calcium 73mg, Sodium: 307mg.